Employee Timecard is the perfect solution for small businesses with employees that work out and about providing services and support to your customers. With two different ways to enter time, you can capture time in the way that works best for you and your employees. Timecard collects not only “in” and “out” times, but also the time and GPS location where it is entered, allowing you to confirm the location of your employees as they work offsite or remotely. You can view all time entered and import it into Quickbooks for invoicing and reporting purposes. In the Time Entry mode, the employees can just enter the time at the day and the Supervisor will be able to run reports for all the employees. Try the app for 30 days FREE today and see how Timecard can improve the accuracy of timesheets, invoicing and employee accountability! Start by downloading the app to your iOS or Android device. Simply search for “Technogems Timecard”. Once downloaded, open the app and register. Fill in your name, email and project name. Register by entering your name, username, password, email and company name. Time – This screen allows you or your employee to enter time with the simple “Check In” and “Check Out” buttons. Report – Customize two types of reports: Report by Date and Report by Project, allowing you to get the information you need, when you need it. Settings - This screen allows you to refresh the app, configure administration settings, upgrade your plan and choose trial options. The time logs available through the app or online allow you to review not only daily entries, but also changes to previously entered time, and the GPS location where and when entries are made. Know where your employees are and what they are doing at all times. 1. How much does Timecard cost per month? Our affordable plans start at $2.99 per month. There are also one year plans for 5 user, 15 user or Enterprise Plan. Description User can enter their own time and see the reports. Cannot see the time reported by other employees in the company. 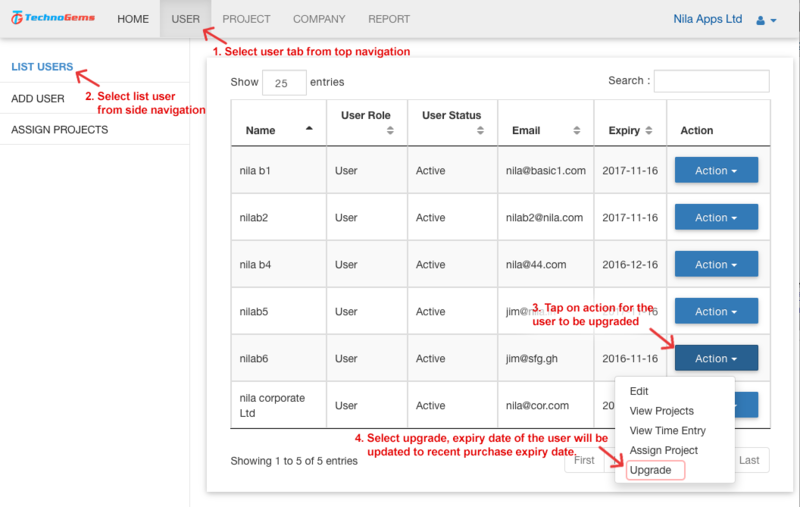 Users can enter their own time and view/manage the time entered by other users in the same company. 2. What payment options do you support? Plans can be purchases by credit card or Paypal, or through Apple’s iTunes store and Google Play. Yes. If you are a supervisor, you can see the time entered by all your direct reports. 2. Our company employees would check in when they start work and check out when they end their day. Will you support this option. Yes. Our check in check out mode supports this option. It automatically calculates the number of hours worked on each project based on check-inand out time. 3. Our employees enter total time worked, not a start time and end time. Does Timecard support this option? 4. What if employees just check in at the start of their shift, and out at the end, with no separating time by project? TimeCard supports this option as well, and calculates the total hours in between for you. 5. Will I be able to enter time from my smart phone? 6. Can I enter time on my desktop? 7. Will I be able to generate invoice based on the time entered by our employees. Yes. you will be able to generate accurate invoices based on the time entered. 8. How do I signup for the service? 9. Do I need a server to run Timesheet for my business? 10. Where do I download the mobile app? Employee TimeCard mobile application can be downloaded from Apple Appstore for iOS devices or from Google Playstore for Android devices. 11. How do I add additional users? As the administrator on a Corporate User plan, you can add more users on the app by going to Settings, AdminSettings, List User and Add User. 12. How many employees can it support? 13. Can I pay for my employee’s account? 14. How do I add users to my already purchased user slots? 15. Where can I see the status of my bulk user purchase? 16. Can I see the time of all my employees? Yes. Just be sure they use the company code when setting up Employee Timecard. Tapping on a entry on dashboard shows time entry detail which include time-entry location of the user plotted on map. 17. Will I be able to build an invoice from the time entered? Yes. Timecard can be imported into Quickbooks. 18. How to transfer a purchase? Click here to see the steps to transfer a purchase.